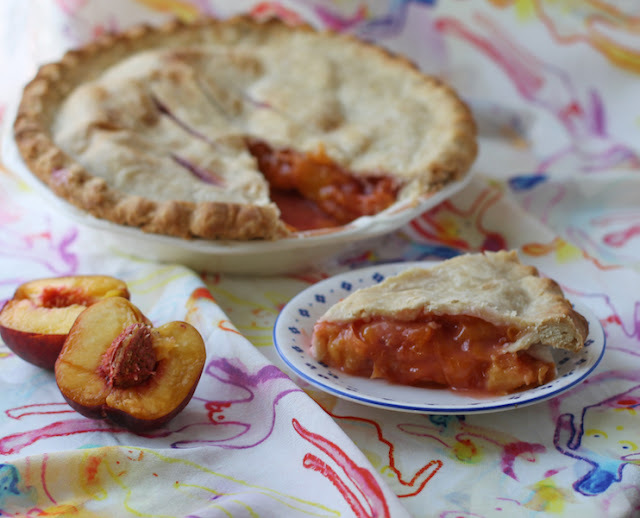 The only thing that smells better than a big bowl of ripe peaches is this old-fashioned peach pie baking in the oven. Serve it with a scoop of vanilla ice cream or some thick pouring cream. A couple of days ago, I went for what I call the annual mashing, that is to say, a mammogram. 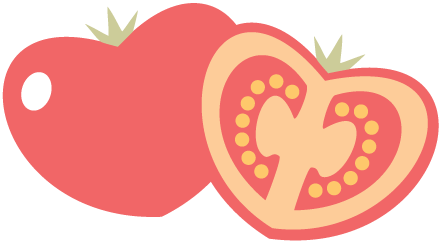 (If you are of the female persuasion and haven’t gone for your well-woman check up in the last year – Just do it! Make the appointment and GO. And do your monthly self breast checks.) I rewarded myself with a stop on the way home at the farmers’ market to buy shelled Texas pecans, peaches, homegrown tomatoes, eggplant and fresh purple-hull peas. I love, love, love fresh peas, which are so hard to find the rest of the year. For dinner that evening, I cooked them simply with garlic, sea salt, black pepper and some smoked paprika. 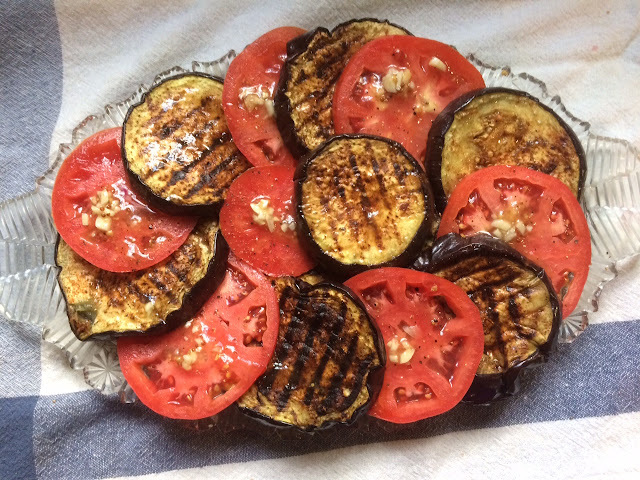 I grilled the eggplant on a griddle pan and made a delicious garlicky salad with the homegrown tomatoes. And the peaches - oh, the fragrant peaches! 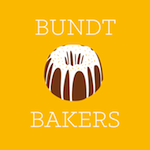 - were destined for pie! 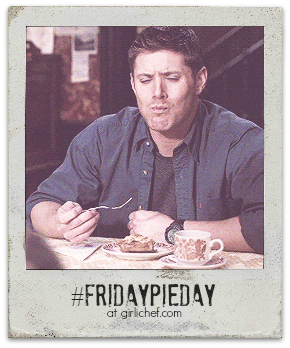 Since it’s the last Friday of the month, I am once again joining my friend, Heather of girlichef for Friday Pie Day. 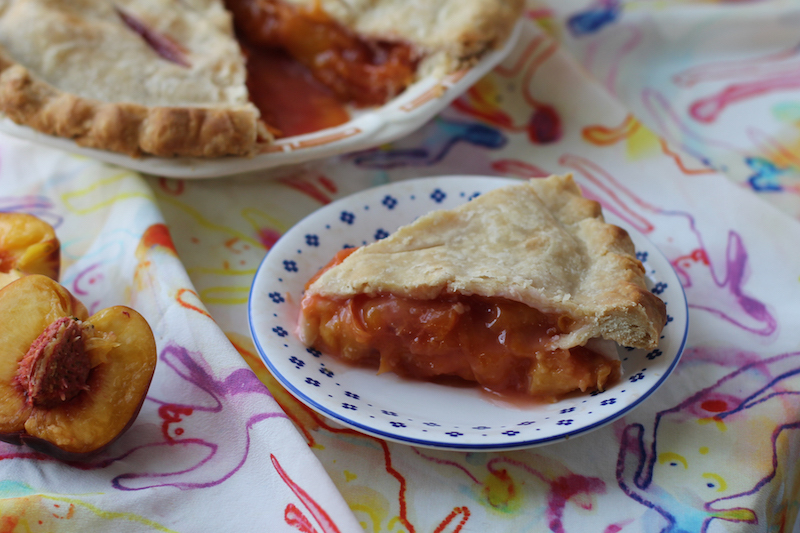 Last month I shared an almond plum tarte tartin made with puff pastry but I really wanted to make a traditional pie with short crust this month. I brought this baby on the road to Louisiana yesterday to visit my aunt and two uncles in New Iberia. I haven’t been to my Louisiana birthplace since a couple of summers ago when my grandmother passed away but it feels good to be here, in such a familiar place, with people who love me, have the same sense of humor and know all the family history and, most importantly, secrets. Where a person can buy spicy boudin and hog head cheese at the local butcher. Where grey Spanish moss hangs in wispy strands from ancient live oaks along a lazy bayou flanked by historic mansions. Where one can get local blue point crabs by the extra spicy half dozen at all the seafood restaurants. Yes, it’s good to be home home. Even if I am missing Gram. 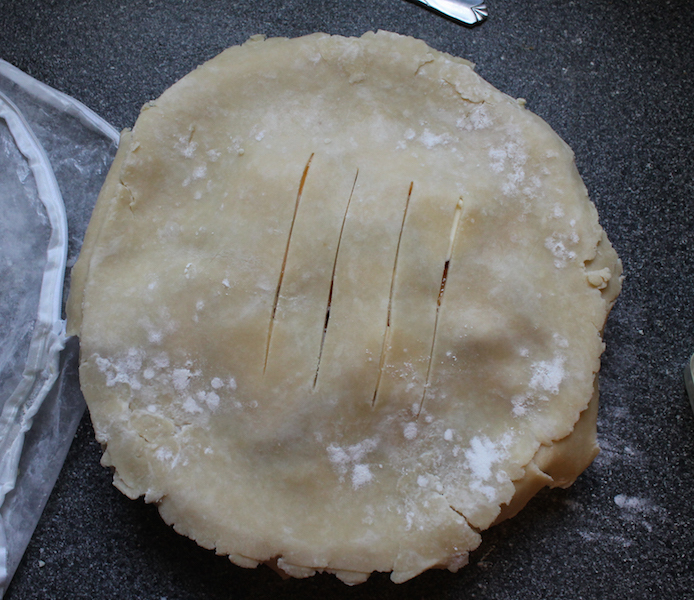 First make the pie crust dough and divide it into two pieces, one slightly bigger than the other. 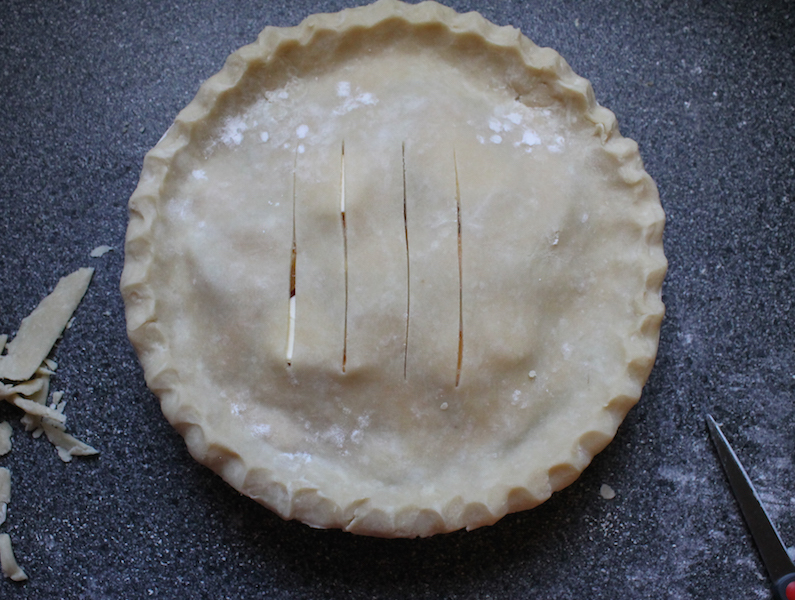 Cover them both in cling film and refrigerator while you get on with the rest of the pie. 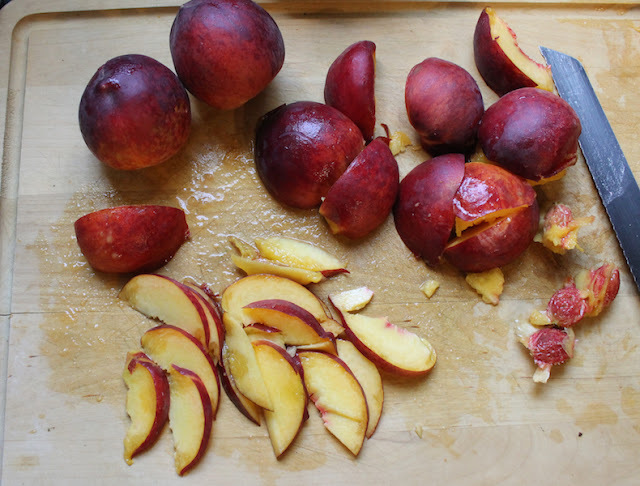 Pit and slice your peaches thinly. You can peel them first if you want but I like the look of the slivers of red and I like the way they color the pie filling when baked. 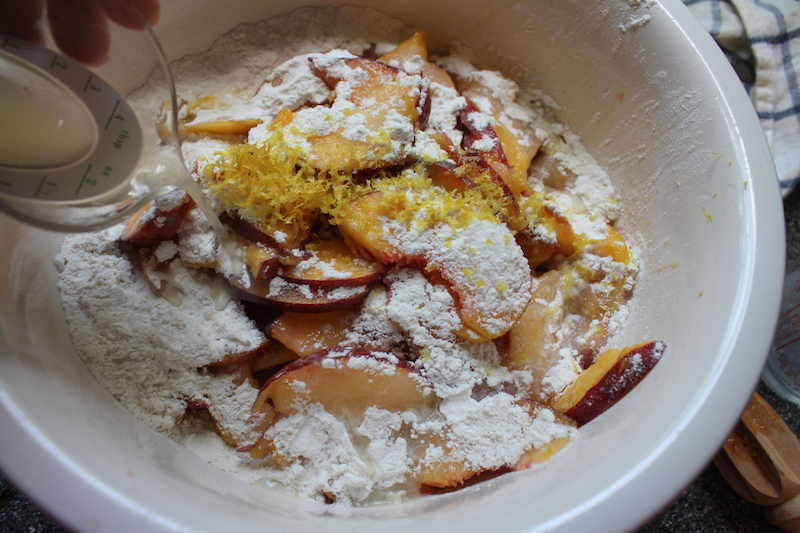 Add the sugar, flour and salt to the sliced peaches then zest in the lemon and add the juice. Stir well. Roll out the bigger piece of piecrust and line your pie plate. Pour the peach filling in and add the butter in small pats. 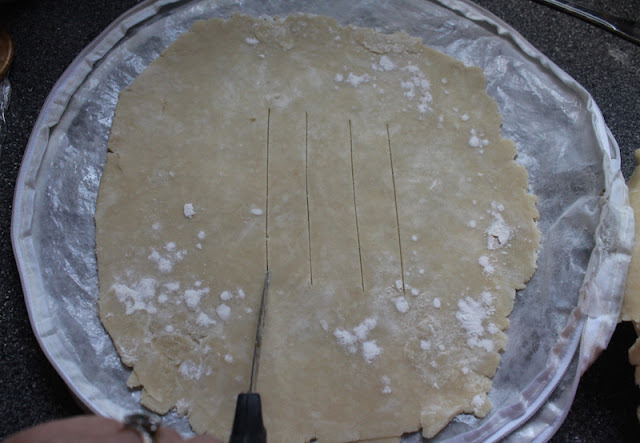 Roll out the top crust and cut three or four slits in it. 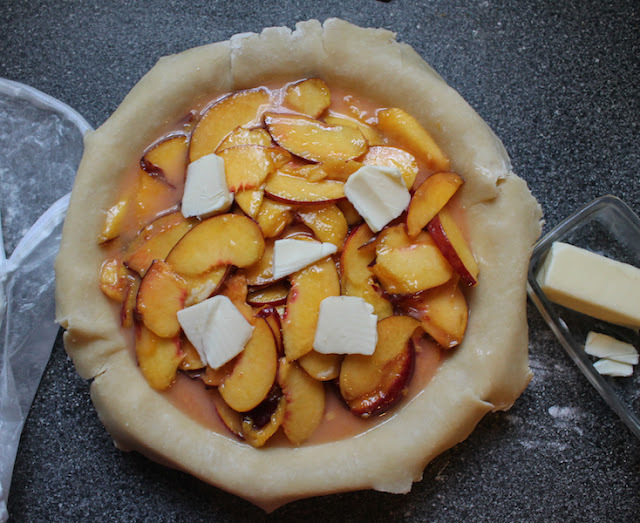 Top the peach filling with the pastry and trim the edges. 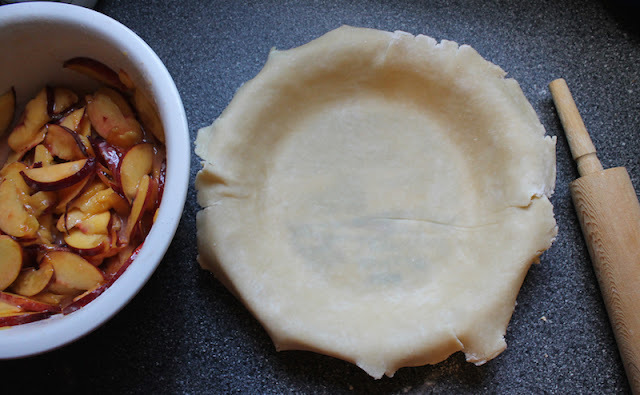 Fold the pastry under and crimp the edges. 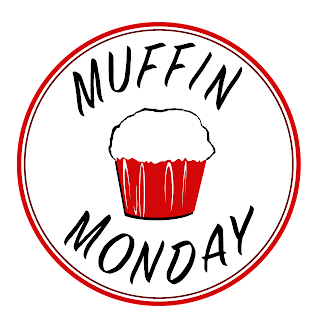 Bake in your preheated over for about 45 or 50 minutes or until golden brown and bubbling. Speaking of bubbling, I suggest you put a piece of heavy duty foil or another baking pan under the pie while baking, because the chances of it dripping over are pretty darn good. 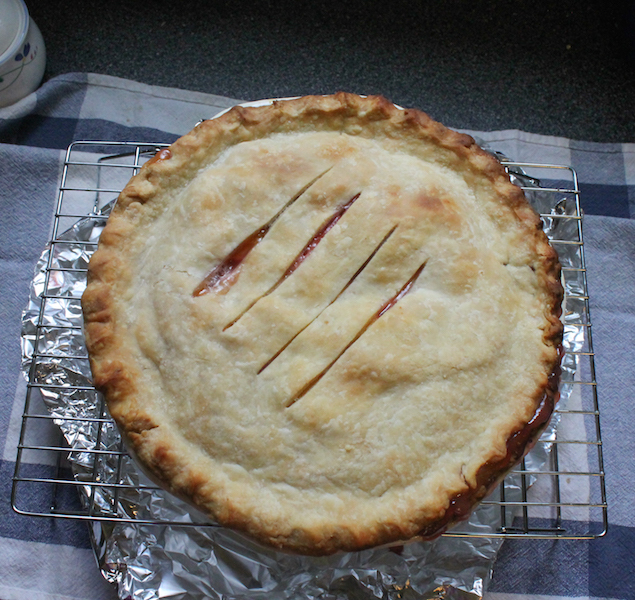 Another tip: Cover it with foil if the crust gets too dark before the baking time is up. 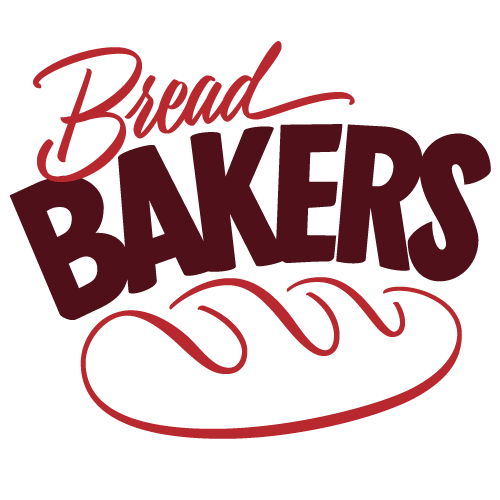 Remove from the oven and cool completely on a wire rack before serving. Serve with vanilla ice cream or heavy pouring cream. I didn't have any for the photos but you can trust me that there was ice cream for the real serving. 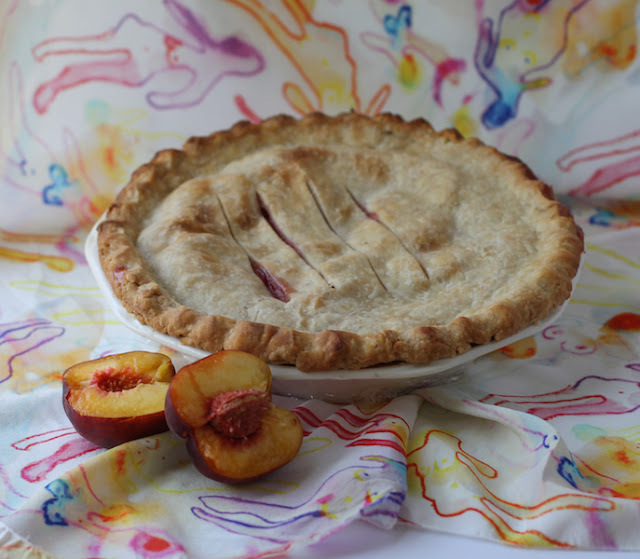 Today, Heather is also sharing a peach pie recipe but she upped the game with the addition of blueberries! Check out her gorgeous Blueberry Peach Pie with Cornmeal Streusel and Crust!